Class 12 Physics NCERT Solutions for Chapter 6 - Electromagnetic Induction are available here. With this article, you will get solutions from question number 6.11 to question number 6.16. These are very short answer type questions & are very important for CBSE Class 12 Physics board exam. NCERT Exemplar Solutions for CBSE 12th Physics Chapter 6: Electromagnetic Induction are available here. In this article, you will find solutions from question number 6.11 to question number 6.16. These are very short answer type questions (VSA). Solutions of multiple choice questions with single correct answer (MCQ I) and multiple correct answers (MCQ II) are already available. These questions are important for CBSE Class 12 Physics board exams & other competitive exams like NEET, WBJEE, JEE Main, UPSEE etc. Consider a magnet surrounded by a wire with an on/off switch S (figure). If the switch is thrown from the off position (open circuit) to the on position (closed circuit), will a current flow in the circuit? Explain. As the circuit will be closed, no change in flux will take place. So, no emf will be produced and consequently no current will flow in the circuit. 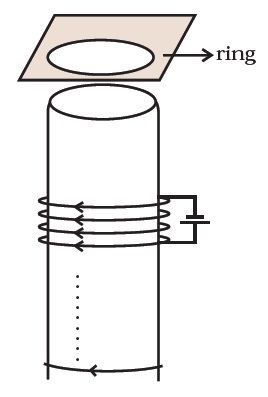 As the coil is stretched, air gaps between successive elements of the spiral coil will increase. Due to which the flux will leak through the gaps. As per Lenz’s law, emf induced must resist the decrease in flux which can be achieved by decrease in current. As the iron core is inserted in the current carrying solenoid, the magnetic field increase due to the magnetisation of iron core and consequently the flux increases. Now, the emf produced must oppose this increase in flux, which can be possible when current decreases. So, the current will decrease. Initially, no flux was passes through the metal ring. When the current is switched on, flux passes through the ring. According to Lenz’s law this increase will be resisted and this can happen if the ring moves away from the solenoid. If the current in the solenoid is as shown, the flux (downward) increases and this will cause a counterclockwise current (as seen from the top of the ring). As the flow of current is in the opposite direction to that in the solenoid, they will repel each other and the ring will move upward. If the current in the solenoid decreases then, a current flows in the same direction in the metal ring as in the solenoid. Therefore, there will be a downward force. This means the ring will remain on the cardboard. The upward reaction of the cardboard on the ring will increase. For the magnet, eddy currents are produced in the metallic pipe. These currents will oppose the motion of the magnet. Hence, magnet’s downward acceleration will be less than the acceleration due to gravity g. On the other hand, an unmagnetised iron bar will not produce eddy currents and will fall with an acceleration (g). Thus the magnet will take more time.